Hèctor Parra, born in Barcelona 1976, studied at the Conservatorium of Music in Barcelona, where he was awarded prizes with distinction in Composition, Piano and Harmony. He studied piano with Mª Jesús Crespo, and composition under David Padros, Brian Ferneyhough and Jonathan Harvey as well as Michael Jarrell at the Conservatorium of Music in Geneva. Master in Composition awarded by the University of Paris VIII, annual course in Composition at Ircam and post-graduate courses at the CNSMD Lyon. He actively participated in the composition workshops of Royaumont, Centre Acanthes, Takefu (in Japan) and Impuls Graz. Premieres of his works have been performed by the Ensemble Intercontemporain, the Klangforum Wien, the Arditti String Quartet, Ensemble Recherche, Ensemble Contrechamps, musikFabrik, KNM Berlin, the Tokyo Philharmonic Orchestra, the Philharmonic Orchestra of Liège, Holland Symfonia, National Orchestra d’Ile-de-France, Barcelona and Catalonia National Orchestra, Proxima Centauri, etc. In 2009 he was awarded the “Tendencies Prize” of the Spanish newspaper “El Mundo” (edition from Barcelona). In 2007 he was awarded the Earplay Donald Aird Memorial International Composition Prize of San Francisco (USA). In 2005 he was unanimously awarded the Tremplin Prize given by the Ensemble Intercontemporain and was finalist in the International Gaudeamus Competition. In 2002 he won the INAEM Prize for Musical Composition (The National Institute for Performing Arts and Music of Spain). His works are published by Tritó (Barcelona). A monographic CD with his trios and chamber music pieces performed by the ensemble Recherche has been published by the label KAIROS (Vienna, 2008). In 2010 KAIROS publishes his chamber opera Hypermusic Prologue, with a libretto of the renowned Harvard physicist Lisa Randall, played by the Ensemble Intercontemporain and IRCAM. The stage design was done by the artist Matthew Ritchie. 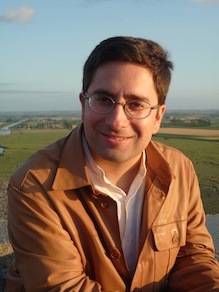 In 2010 he composes the music for the film Equinoxe, by Laurent Cárceles, recorded also by the Ensemble Intercontemporain. Currently, he is Professor of Electroacoustic Composition at the Conservatorium of Aragon (Spain) and resident composer at Ircam in Paris. He lives in Paris since 2002.